Congratulations on the purchase of your Crystalase Ankh and welcome to the Ankh family. When individuals continually wear their Crystalase Ankh, they can help amplify universal consciousness, much like the mind principle that when three or more gather together an increase in frequency fields can occur. There are a few considerations to note when wearing your Crystalase Ankh. To clear and cleanse your crystal, hold the point under flowing cold water for a minute or more. Rub gently with a soft cloth to dry it. Silk, wool, and cotton are preferable choices in the given order. This massaging with the use of your energy may produce a transference of piezo electric energy for a PK effect (increased energy). The quartz crystal can collect and neutralize the negative and emotional debris in your immediate surroundings. To prevent over saturations, it is vital that you cleanse your ankh at least once daily to clear it. Lack of a daily cleansing routine may cause breakage or loss from excessive build-up of negative energy. Repeat cleaning procedures more frequently per day when you are having an emotional day, are around emotional individuals and large groups. Always rinse it immediately following a healing session. Use a jewelry cleanser or baking soda-salt water (toothpaste also works) to keep metals shiny and bright and to prevent the copper-silver wire twists from oxidizing. This is a natural occurring process, especially if you are a smoker or are detoxifying. Metals oxidize faster when worn directly next to the skin. You may want to wear it in between layers of clothing or on the top layer of clothing to prevent rapid oxidation. Send loving vibes to revitalize and to continue the energy flow on a positive note. Your Ankh has been made with TLD. Quality crystals are hand selected for your satisfaction. Craftsmanship is guaranteed, not lost or broken points. If your first Ankh is damaged it may or may not be repairable. Converse with me about the damage before returning it. Kinesiological testing of the Ankh will determine whether that is possibly to repair it. A new “second time around” Ankh is reduced to half price if it needs to be replaced to the same person due to breakage or loss. Use a chain or pin to secure your Ankh. It is not wise to place it in a pocket. The ankh can easily fall out of your pocket and damage or break the crystal tip. Your Crystalase Ankh is tuned to your frequency with the application of the gems or zinc tips that may have been added to support your energy system. Some individuals test for “no additions.” The pendant acts like a “tuning fork” to balance, harmonize and deal with symptoms specific to you, whether you are aware of them or not. Your personalized Ankh is usually priced in the $225-250 range depending upon crystal, gem, and zinc tip selections. It is a frequency generator, not just jewelry. Pendants are non refundable since it has been customized specifically for you. Crystalase Ankh was designed as a Pendant due to the little amount of effort and time it takes to put it on the body. Many individuals will not take time from a busy schedule for energy treatments but can easily and consistently wear the Ankh without much attention. It is most effective when worn around the neck and over the thymus. A 20- to 22-inch gold, silver, or leather chain is usually the best choice for attaching it. Your Crystalase Ankh Pendant is not jewelry. It is an energy amplifier to keep your immune system charged, a neutralizer-stabilizer of negative emotions and a protective shield from low frequency electronic devices such as computers, TV, high voltage power lines and the like. Your Crystalase Ankh is a very effective way to accelerate healing by wearing it or by using specific practices. A simple technique that can be used for yourself or others for pain elimination, energy blockages and chakra balancing is described as follows. Hold your Ankh at the crossbar between your index finger and thumb with the loop upright. Use your eyes to intensify, magnify, and focus the energy through its laser-loop and direct the energy to the area needing attention. The focused energy (with the help of your eyes) will move through the loop as a laser beam or magnifying glass. This energy can be directed to the specific pain spot and to an area or chakra needing to be balanced and harmonized. By doing this simple technique, I have seen headaches disappear, hip pain eliminated, emotional balancing effects occur, plus more astonishing results. There are more procedures, but this will get you started. You can experiment positioning your Ankh in your left hand as you meditate or use the crystal-tipped point on your brow chakra (third eye). The positioning may vary from day to day. You will intuitively know what feels appropriate for each session. This seems to improve your ability to receive transmissions with greater sensitivity and clarity. Dreams are often clearer, more colorful and detailed with better recall when using the Crystalase Ankh. These dreams can serve you through their daily communications. You will need to interpret your symbols to better understand the coded messages sent by your subconscious mind. Experiment with the various options when deciding the best position-location for your Ankh for maximum recall performance. Ankh can be laced at your bedside, under your pillow, hung nearby on the headboard or worn around your neck. The Ankh can be used as a pendulum to get answers from you higher mind through your subconscious mind, by-passing your logical mind. Concentrate on a specific question and your Ankh will respond as a pendulum with a yes or no answer. Your sensitivity will improve with practice. Hold your ankh hanging from a chain in your preferred/dominant hand. Clear the mind and relax. Wrap chain around a finger or two and steady your arm-hand while focusing on one simplified question you would like answered. First ask your higher Self through the Ankh for its 'yes' response, then its 'no' response. It will move in an up-down or side to side fashion (like a nodding head that indicates yes or no), in a circular manner - clockwise or counterclockwise. If it does not move or changes direction, it is usually giving a response as a multi-factor question. Restate the question in another way or a simpler way. Once your yes-no is determined, ask one question and wait for a response. Blind testing is best to avoid interference from your logical mind. To do this, write a question on a piece of paper and fold the paper so you do not see the question. Repeat the process with any other questions you may have by writing it on more pieces of paper. Mix the paper pieces so you do not know what the questions are. Then continue to focus the pendulum to get a yes/no answer, one by one. Write 'yes' or 'no' on the outside of each piece of paper without looking at the question until you have completed doing all the questions. Look when you have received answers for all your questions. Recorded practice sessions will help you to trust what you receive. To shield against negative radiations and ELFs/low frequency electronic devices wear as a pendant over the thymus. It is extremely important to cleanse your Ankh due to the accumulation from these negative energy fields. ELFs include electronic household appliances (copiers, TV, computer terminals, microwave ovens, bedside AC electric clocks and AC razors) and high-voltage power lines. You may feel dramatic vibrational changes as you begin to wear your Ankh. You might be a person who absorbs the energy in subtle ways. Regardless, you will be receiving the energy transference through your crystal Ankh to charge and balance you. Rates and degrees of accelerated change vary from person to person. Some individuals change within hours while others do not stabilize their energy for several months. This is a personal matter between you and your Ankh. When you are ready the changes occur (similar to the verse, “when the student is read the teacher appears”). Dramatic vibrational shifts are felt the most when you first start to wear the Ankh. Then if may feel like the energy shift has subsided. The Ankh has not quit working for you but has instead reached a plateau. Continue to wear your Ankh as the flow of energy will recharge your circuits whether you realize it or not. The shifts are often felt by energetic, calming and balancing effects. 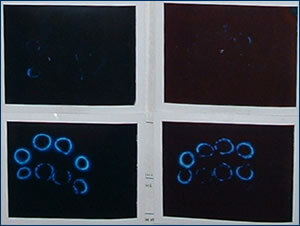 Muscle testing helps you feel the changes while Kirlian Photography visually shows you these changes. Stabilized energies do not always occur immediately but eventually circuit strengths are usually seen.